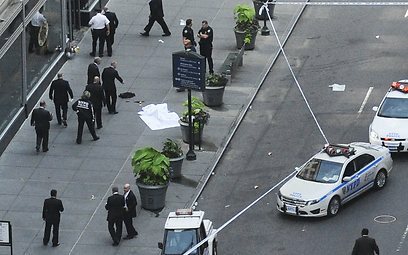 Two people were killed and at least eight others were wounded in a shooting outside of the Empire State Building in New York City on Friday, according to a New York police source. The victims' injuries are said to be non-life threatening. The NYPD said that the one of the dead men was the gunman. Federal officials said that the shooting was a criminal incident and that there is no apparent link to terrorism. New York Police Commissioner Raymond Kelly identified the shooter as Jeffrey Johnson, 53, a disgruntled ex-employee of Hazan Imports. According to initial details he arrived at the office and fired three shots at his boss, from point-blank rage, before going on his shooting spree. A witness said that he was firing indiscriminately. A fire department spokesman said that the NYFD received a call about the shooting just after at 9 am (1 pm GMT) Friday and that emergency units were on the scene within minutes. 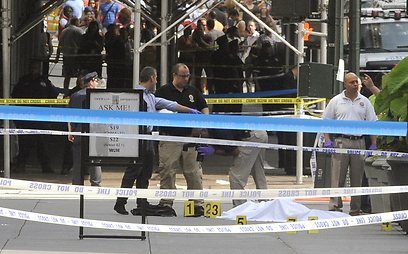 The shooting occurred at 34th Street and Fifth Avenue, just beside the city's iconic skyscraper and a massive tourist attraction. Eyewitnesses said that massive police forces are at the scene. According to NY1, police have corded off 34th Street Park and Sixth Avenues and Fifth Avenue between 42nd and 34th Streets. NYPD cleared the scene and allowed people back inside the building within an hour. New York Mayor Michael Bloomberg said that some of the victims may have been shot accidentally by the police. The shooting broke out at the height of the tourist season outside one of New York City's most popular attractions, startling tourists and commuters in one of the busiest areas of the city. The building is two blocks from Pennsylvania Station, one of New York City's main transportation hubs. See all talkbacks "2 dead, 8 injured in Empire State Building shooting "